You can detach 1 material from this card; Special Summon 1 “Salamangreat” monster from your Deck in Defense Position, also you cannot activate monster effects for the rest of this turn, except FIRE monsters. If this Xyz Summoned card is sent to the GY as material for the Link Summon of a “Salamangreat” monster: You can target 1 monster on the field; return it to the hand. You can only use each effect of “Salamangreat Miragestallio” once per turn. Armored Rapidash became Dark type? Happy Friday, Everyone! 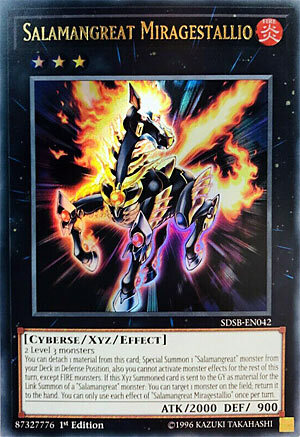 Salamangreat Miragestallio is a Rank 3 Fire Cyberse-type XYZ Monster with 2000 Atk and 900 Def. The stats are really good, with only Dante being the generic notable “strong” Rank 3. For any 3 Level 3 monsters you can XYZ Summon a monster that can special summon any Salamangreat monster from your deck in def position at the cost of one material. Sure it’s only once per turn, but that doesn’t make the effect bad, just balanced. If it was XYZ Summoned and then used as Link Material for a Salamangreat Link Monster, you get to bounce any one targeted monster back to the hand. This can really help your Link Monsters do some damage and the first effect sets up Link Climbing very well. The second effect is also once per turn, while the first effect restricts you from activating monster effects from non-Fire monsters. Other than that, Miragestallio is missing an n at the end of its name for some reason. Put two in the Extra Deck and watch out for the Squirtle Squad. Re: yesterday’s review. It’s regrettable how unremarkable it was, at least to me. I shall require higher standards from myself. Happy Friday! We end the week off with the Xyz of the Salamangreat archetype, Salamangreat Miragestallio. Miragestallio is a Rank 3 FIRE Cyberse with 2000 ATK and 900 DEF. Stats are good on a Rank 3, FIRE and Cyberse are both nice to have in the deck and I’d expect all Salamangreats to have this trait. The summoning requirements are any two Level 3 monsters, which I’m sure we know how easy that can be in Burning Abyss, but you aren’t mixing Salamangreat with BA I’m sure, but the Salamangreat archetype has enough Level 3s to work with. You can detach a material from this card to Special Summon any Salamangreat monster from your deck in Defense Position, also you can only activate the effect of FIRE monsters for the rest of the turn. That restriction is super necessary as you don’t want to make Salamangreat too splashable for decks, it’s clear they learned from M-X-Saber Invoker. This card is a great extender for your plays to get you into Sunlight Wolf quick enough without having to give this up as material. The best thing to summon from the deck might be Jack Jaguar so you can use his effect to revive himself to a zone Sunlight Wolf points to when you summon Wolf so he can then retrieve a monster from your graveyard. If this Xyz Summoned card is sent to the graveyard as Link Material for a Salamangreat, you can target a monster on the field and return it to the hand. Salamangreat don’t benefit from self bouncing too much, so you’re likely targeting an opponent’s monster, which this effect is nice to have considering you did give up 2 Level 3s to summon this, but it isn’t necessary as the effect Miragestallio is good enough to warrant Xyz Summoning it, and sometimes you might not even use it for Link Material and instead save it for your next turn, assuming it survives. Both effects are a hard once per turn to keep some balance in the deck, as it should be. Miragestallio is a great Xyz in the archetype and worth playing a copy of considering Sunlight Wolf and Jack Jaguar can put it back to the Extra Deck with ease if you ever need another copy of it. Art: 4.5/5 I wouldn’t want to ride that stallion. Lookie here y’all, an XYZ Monster! Salamangreat Miragestallio (say that five times fast) is a Rank 3, Fire, Cyberese XYZ Monster, with 2000 attack (fine for Rank 3) and 900 defense, who requires two generic Level 3 Monsters to be XYZ Summoned. So, for starters, by discarding an XYZ Material you get to Special Summon a theme Monster from your Deck in face-up Defense position. That’s a solid 1-for-1 trade that should generate you advantage almost (if not) immediately, and new Monsters brought out that easily are always a good thing, which helps set up other plays. You’re then prevented from using non-Fire Monster effects for the rest of the turn, which shouldn’t effect you at all in the theme, as you should by now be aware. If you use Miragestallion for a Link Summon (if this was first XYZ Summoned) you get to select a Monster on the Field and return it to the Hand (your Monster or one that belongs to the opponent). Each effect is naturally, once per turn. The bounce effect is nice, it can spin something big off the Field you might not be able to destroy, or something back to the Extra Deck, reuse a card of your own, good options either way. Art: 5/5 So our stallion here isn’t much of a mirage, this picture is pretty great though. The brightness of the fire maybe distracts from the all dark body, hence the mirage in the name? The dark body would blend nicely in the background…but again, the fire, so I don’t know.